Kawaii Kon released the first edition of its schedule for this year’s show on Friday, along with a spiffy new app (in both iOS and Android flavors!). Whenever big, juicy chunks of information like this drop in front of me, my friendly neighborhood anime/manga/Con-athon blogger instincts immediately kick in and I try to soak up every last newsworthy tidbit contained within. And boy, was there something newsworthy in there. 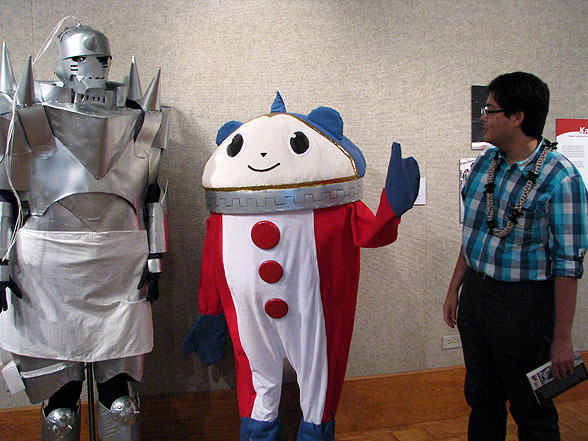 More specifically, there was something newsworthy in what wasn’t in there — a longstanding presence at Kawaii Kon, one that’s been around since 2007. After 10 straight years, there’s no sign of a nemu*nemu booth in the dealers room. For artist Audra Furuichi, to not be a part of Kawaii Kon 2017 meant either that there was a mistake somewhere in the grand scheme of scheduling things, or she was shifting her resources elsewhere. Sadly for fans of Audra’s work, the latter is true. Unbeknownst to many of us at the time, the nemu*nemu appearances at the Hawaii Collectors Expo last month and the Mid-Pacific Institute Hoolaulea on Friday were the last we’ll be seeing for the immediate future. In addition to Kawaii Kon, that rules out appearances at other Oahu Con-athon events — Comic Con Honolulu, Amazing Hawaii Comic Con and Anime Ohana — as well. She also cited an evolving audience as a factor. The nemu*nemu online comic has been on hiatus since last July as she’s worked on other projects, and not as many people know about the plush pup duo as they did in the comic’s early years. “Thought about doing the (Artist Alley), but the long hours and EXTREME COMPETITION OMGWTFBBQ … are big deterrents for me,” she said. This doesn’t mean the end of all things nemu*nemu, though. Audra’s exploring swinging by Kawaii Kon for a day to drop off something for the art show. The nemu*nemu: Blue Hawaii comic strip is still chugging along in the Star-Advertiser. And she’s been posting some pretty non nemu*nemu artwork at audrafuruichi.com. 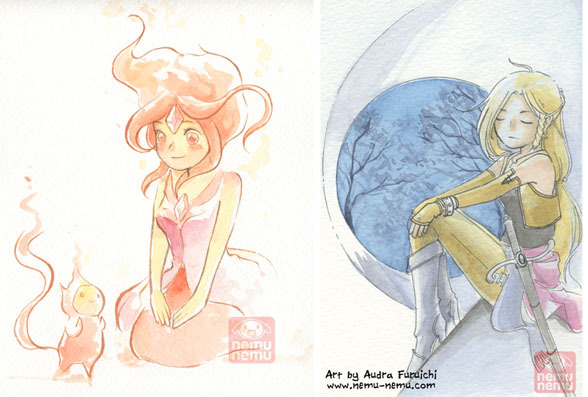 There’s now an added incentive for people to jump on board: If contributions reach $550 a month, she’ll start regularly drawing a one-shot nemu*nemu comic again, once a month. It’s a perfect incentive for the comic’s 11th anniversary coming up April 1, and all it’ll take is one person contributing $28 a month, or 28 people contributing $1 a month, or some happy medium in between. Isle-born Stan Sakai, creator of the comic book Usagi Yojimbo and longtime letterer for Groo the Wanderer, is highly regarded as one of the Really Nice Guys in the comic industry. Tag-team partner in fandom Wilma J. and I found this out firsthand back in 2006, when we sent him a bunch of questions for a Kawaii Kon preview article and he sent back enough material to write that article, an online-exclusive supplement with his travel journal and artwork that ended up gracing our weekend section cover for our con coverage that year. 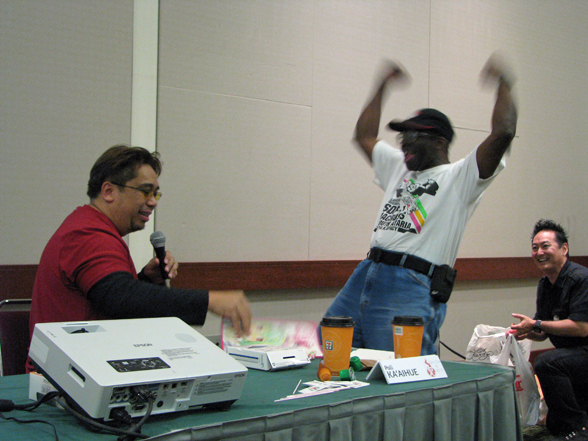 He’s been a guest at two Kawaii Kons — 2006 and 2009 — and I’m sure anyone who sat in on one of his panels would agree that he’s quite an engaging fellow. 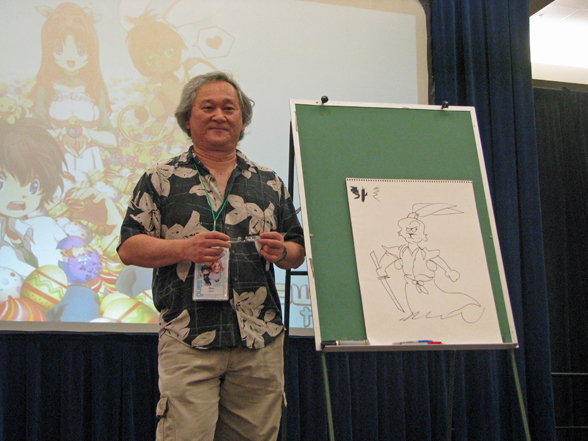 Here’s a picture of him at Kawaii Kon ’09 with a sketch of Usagi, his most famous creation. What many people probably didn’t know, though, was that around two years before Stan’s first Kawaii Kon appearance, his wife, Sharon, had been diagnosed with a benign meningnoma brain tumor. And while radiation treatment and regular MRIs seemed to keep it in check in subsequent years, according to Stan, it started growing aggressively again in 2010. She has facial paralysis on the left side (everything happens on the left side). The paralysis includes her throat, vocal chords, and it has even deteriorated her neck bones. She had lost almost 40% of her body weight in a year. She is undergoing chemotherapy. Doctors don’t see any end in sight for this. There are complications because of the tumor, medications, or just coincidence–diabetes, high blood pressure, rapid heart rate, compromised immune system. She has a tracheostomy tube for breathing and a G-tube connected to her stomach for a liquid diet. She can take nothing through her mouth. She is bed-bound, but we try to give her daily physical therapy–walking a couple hundred feet with a walker and/or sitting in a wheelchair. While there have been regular updates on Sharon’s condition on Stan’s page, friends and colleagues have largely shown their support by sharing their thoughts, prayers and well-wishes with the couple. Now, however, a more formal campaign to help pay for the mounting medical bills has emerged: CAPS, the Cartoon/Comic Art Professional Society, is organizing a charity art auction and is now soliciting donations from artists worldwide. The actual auction itself will be announced at a later date. Artists, you can find a form that you can download, fill out and send in with your contribution at www.garageartstudio.blogspot.com/2013/11/help-stan-sakai.html. If you aren’t artistically inclined but still want to donate to the cause … well, this part of the post was where I was supposed to write that you could go to that same Garage Art Studio post and donate via PayPal, but the link is broken at the moment. Stay tuned either here or to my Twitter feed for any further updates. This special holiday shopping edition of the Ota-cool Incoming! calendar, spotlighting one special anime-themed shopping event and craft fairs where regular local anime con vendors like idkwhat2wear, Bit of Sugar and Team nemu*nemu, Audra Furuichi and Scott Yoshinaga, will be selling stuff over the next few weeks, is unofficially brought to you by “Black Friday vs. Cyber Monday,” a classic nemu*nemu comic strip from 2009. Can’t make it to any of these events? Vendor websites are linked in the paragraph above. It should be noted that nemu*nemu has their holiday sale running through Dec. 16 (might I recommend the $25 e-book bundle with all six volumes, freshly recolored volumes 2-4 and introductions by industry luminaries including a certain friendly neighborhood anime/manga blogger?). Audra’s taking commission requests, to boot; I’ve always had to restrain myself from buying every single piece Audra’s ever drawn, so now’s your chance to have that very same conundrum of choosing what you want to buy. Meanwhile, over at idk’s site, you can only buy their shirts at the moment, but every order comes with two randomly chosen buttons. Art+Flea Presents “Totoro Black Friday”: The monthly “destination for creatives, by creatives” takes a Ghibli turn this month. Shop for one-of-a-kind handcrafted items from dozens of vendors. and celebrate the works of Hayao Miyazaki, to boot. 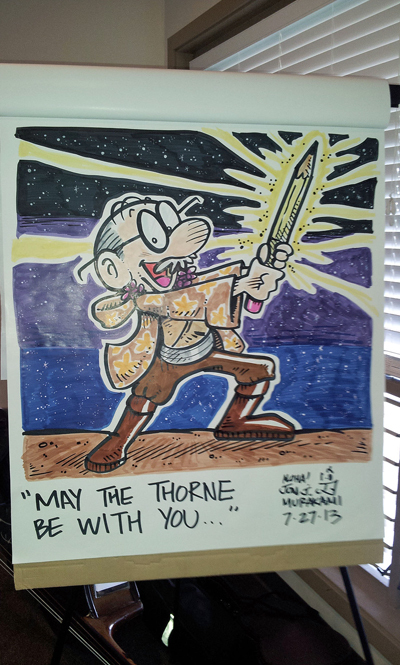 Swing by the Photo Ops Hawaii photo booth or watch Andy Lee of Charisma Industries work his drawing magic live, too! Admission: $3, but you can take $1 off if you come dressed as your favorite Ghibli character and another $1 if you bring a new, unwrapped toy for Toys for Tots. Fresh Cafe (831 Queen St.); 5-10 p.m. Friday. 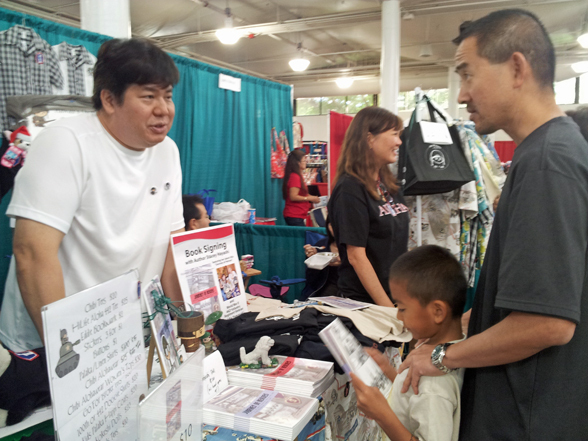 Hawaii United Okinawa Association Winter Craft Fair: With idkwhat2wear (yup, it’s a split-squad weekend for them! ), the nemu*nemu crew and all the fresh-out-of-the-fryer andagi and other tasty Japanese treats that you can afford to eat. Admission: Free, but $5 will get you into the banquet hall (where idk and nemu*nemu are) 30 minutes before the formal opening time. Hawaii Okinawa Center (94-587 Ukee St., Waipio Gentry); 9 a.m. to 3 p.m. Saturday and 9 a.m. to 2 p.m. Sunday. “An Evening in Waipio”: With idkwhat2wear. Think of it as like the Winter Craft Fair mentioned above — right down to the $5 early-bird offer — except in the dark of night. Hawaii Okinawa Center; 5:30-8:30 p.m. Dec. 11. Moanalua High School Winter Craft Fair: With idkwhat2wear, the nemu*nemu crew and Bit of Sugar. Admission is free, but bring your walking shoes if you’re not there at the crack of dawn waiting for parking, because you’ll probably be hiking from somewhere in the surrounding Salt Lake neighborhood. 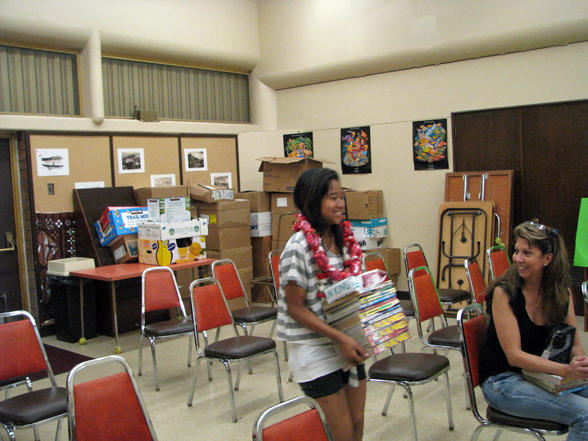 At the high school, 2825 Ala Ilima St.; 9 a.m. to 3 p.m. Dec. 14. Ahhh, Anime Expo. Largest anime convention in the U.S., usually held Fourth of July weekend in Los Angeles, tons of people lining up for everything, enough that I’ll probably never go to it (Fanime’s probably the largest show I’ll ever willingly visit, thankyewverymuch … and after last year’s experience, even that is a bit iffy now). This year is AX’s 22nd year, and along with the usual pre-con activities — guest announcements! Room expansions! Preregistration deals! — they’re currently hosting a cosplay photography contest on their Facebook page. 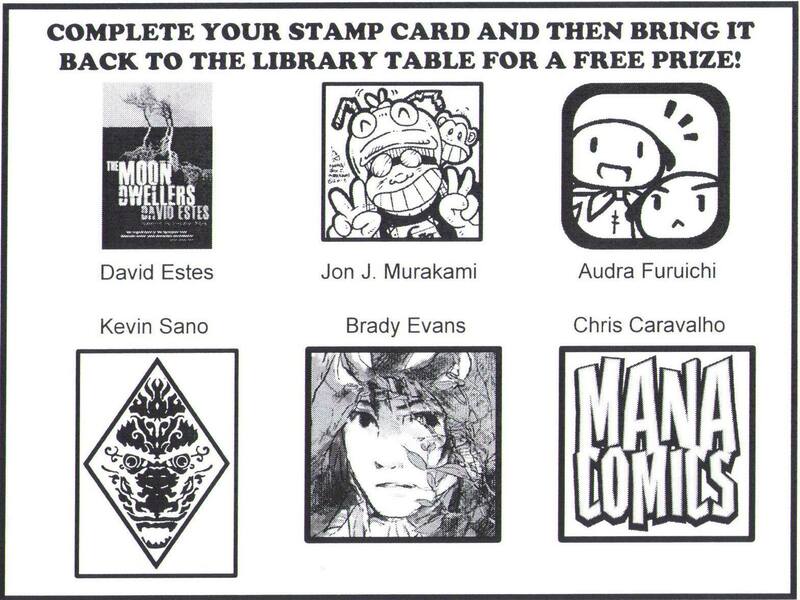 The winner will receive $250 and a badge for AX 2014 and have their photo reprinted in the AX 2013 program guide, while the top 15 photos will be on display at this year’s convention. As of Thursday night, when I was writing this post, Team Wolf Pack was running in 11th place with 251 votes — 15 behind Kirito & Silica from Sword Art Online in 10th, 24 ahead of the Onceler from The Lorax. Now, I freely admit that this blog can’t muster up enough votes to push Team Wolf Pack into the top spot, with this Diablo 3 Demon Hunter already at 1,241 votes. We have only a few dozen loyal readers, plus I’ve had experience pushing for something in the past, only to have it fall way, way, way, way, waaaaaaaay short of its goal. But if this post can help nudge our local cosplayers up a space, I’ve done my job. To vote, just go to the contest page on Facebook — I’ve direct-linked the photo above to their page, or you can click here — and “like” it. You have until May 22 to vote, so have at it. 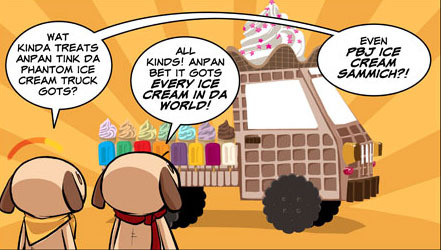 Meanwhile, over in the world of kids’ comics, Audra Furuichi’s nemu*nemu is up for a pair of awards in the 2013 Kids Comic Revolution comic awards: “Favorite Webcomic” and “Special Award for Excellence in Drawing Delicious-Looking Food” (the latter for the Phantom Ice Cream Truck strip in February 2012). Babymouse and Squish artist Matthew Holm — in town a few months ago as a guest at McCully-Moiliili Library — is also up for a few awards, including “Favorite Graphic Novel” (for Squish volume 4), “Favorite Cartoonist/Author” (with his sister Jennifer) and “Cutest Comic Character” (Babymouse). Now, I would say to go out and vote for Audra and Matt just as I voted for them, but there’s just one small problem: I’m not a kid. Perhaps my mental age is such, what with all these anime and manga and video games and other firmly-young-adult material surrounding me at the moment, but physically, I haven’t been a kid in years. And that’s the thing: The Kids Comic Revolution awards can only be voted on by kids. And I’m not sure if anyone regularly reading this blog — save, perhaps, the librarian faction — has access to anyone in that valuable voter demographic. But if you do know any kids, send them over to mlatcomics.com/krc/kcrawards13 to vote. You can also find a PDF version of the ballot there, which you can fill out and mail in; details on where to send it are available on the site. On the bright side, watching it that many times, one starts noticing certain subtle things about the movie. More details on that after the weekend. Friday-Wednesday: 11:05 a.m. and 1:05 and 3:20 p.m.
And as always, you can buy your tickets in advance here. 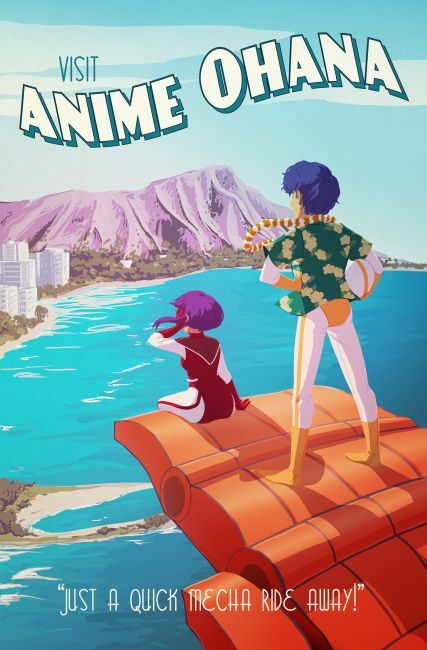 Anime Manga Society at UH-Manoa: Meetings during Summer Session 1 are every Friday starting May 24 through June 28. in Kuykendall Hall, room 306. Screenings TBA. 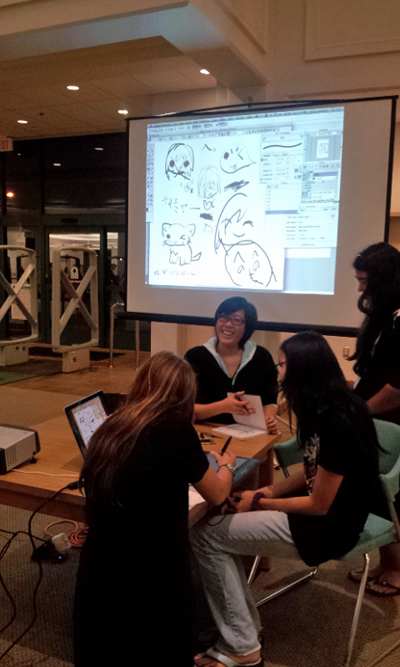 5:30 to 7 p.m.
MangaBento: This group of anime- and manga-inspired artists usually meets every second and fourth Sunday of the month at the Honolulu Museum of Art School (1111 Victoria St., room 200). Visit www.manga-bento.com. Next meeting: 1 to 4 p.m. May 26. 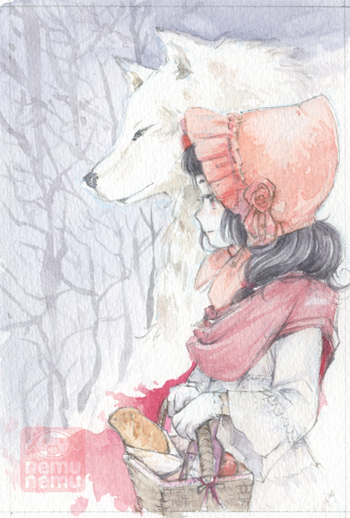 Tomo-E-Ame: Friends-Drawings-Candy: We’re now in the submissions period for MangaBento’s 2013 exhibit at the Honolulu Museum of Art School, with 2-D piece that are 11 inches by 17 inches or smaller now being accepted during MangaBento meetings. 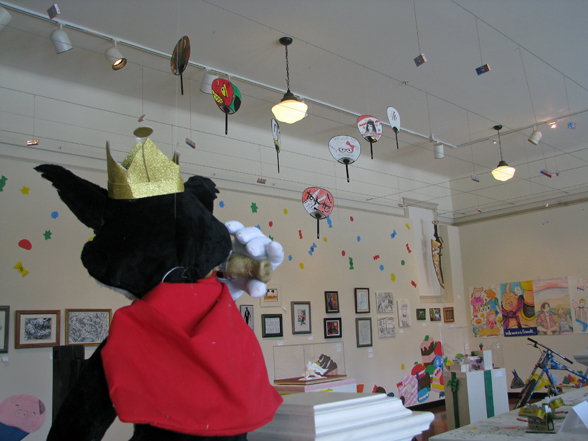 Larger 2-D pieces and art in other media will be accepted on June 9 in the art school’s mezzanine gallery. As for the exhibit itself? That’s June 16-July 14. Five nemu*nemu pins. Exclusive designs. Exclusively at McCully-Moiliili. Waaaaaaaaaaaaaaaaaant. General program runs June 2-July 6, with registration beginning May 28; check your local library for exact dates. Oni-Con Hawaii: With guest Yuko Ashizawa, a fashion designer with Atelier Pierrot. Also featuring the Cosplay Chess Brigade and Yu x Me Maid Cafe & Host Club. Preregistration open now; $35 for a three-day pass. Artist Alley applications also being accepted (it’s $110 per table, which includes two three-day passes). Hawai’i Convention Center, Nov. 1-3. 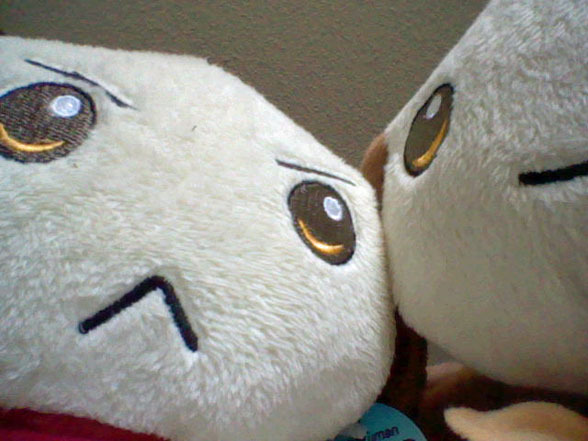 Kawaii Kon 2014: Guests include voice actors Michael Sinterniklaas and Stephanie Sheh. Preregistration open now; $37 for a three-day pass for children ages 5-12, $42 general admission. Hawai’i Convention Center, April 4-6, 2014. One of the things I was sadly negligent in talking about in this space in the past few weeks was the nemu*nemu custom Gelaskins order that Kimonokitsy Studios — artist Audra Furuichi and husband Scott Yoshinaga — was running. I actually bought a few — some for technology I don’t even have yet, but which I’m planning to buy in the next few weeks! — and threw one of ’em on when it arrived earlier this week, and then … well, if you saw what happened over on Facebook when the nemu*nemu plushie foursome arrived at the office, you can kinda guess what happened next. 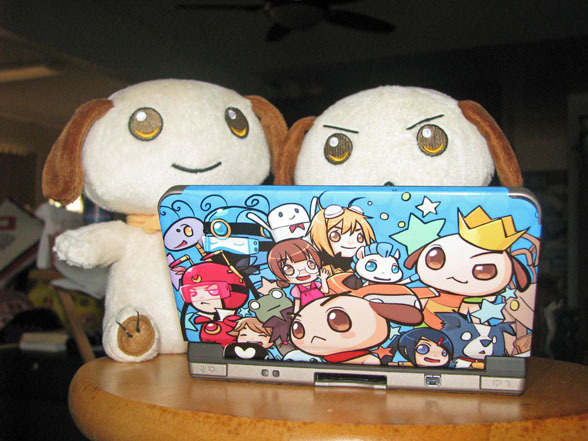 Yes, Anpan and Nemu got their paws on a Gelaskinned Nintendo DSi XL. And yes, that’s the camera app that they’re playing with. Here’s the proof from their perspective. … and yes, I am such a dork for taking the time to take pictures like this. But that’s okay. My inner child and I have been BFFs for … well, pretty much my entire otaku journalism career. The reason I bring up this story is because Audra and Scott are gathering orders for another custom print job — not Gelaskins this time, but Spreadshirt T-shirts. That design above, their “7th Anniversary” style? That’s the newest design to be added to a stack that also includes King of Pizza Anpan, Danish Donut King Nemu and Galaxy Explorer Enchilada. Those join several other online-exclusive designs in a variety of colors, in styles for men, women, children and toddlers. So you definitely have options. Group orders will be accepted through May 3; visit ow.ly/ksUwn for details on how to order. In case you’re reading this post after May 3, you can order directly at nemunemu.spreadshirt.com. We’re heading into week 4 of Poppy Hill screenings at the Kahala 8 theaters, and given the sharp cutback in the number of screenings, I feel fairly confident in saying that these will probably be your last chances of seeing this movie for a while. There are only 14 screenings over the week — less than half the number we saw these past three weeks — and if you were hoping to catch it at night, it looks like you’ve missed that opportunity. Today and Saturday: 10:30 a.m. and 12:40 p.m.
Monday through Thursday: 12:30 a.m. and 2:40 p.m.
Monster Drawing Workshop: April has been the month to learn how to design your own manga characters (courtesy of Hachi Maru Hachi artist Tara Tamayori) and how to add manga faces to them (courtesy of MangaBento). To put a neat little bow on things, perhaps you’d like to learn how to create your own monsters to harass your manga creations (or befriend them, because hey, it’s your story)? 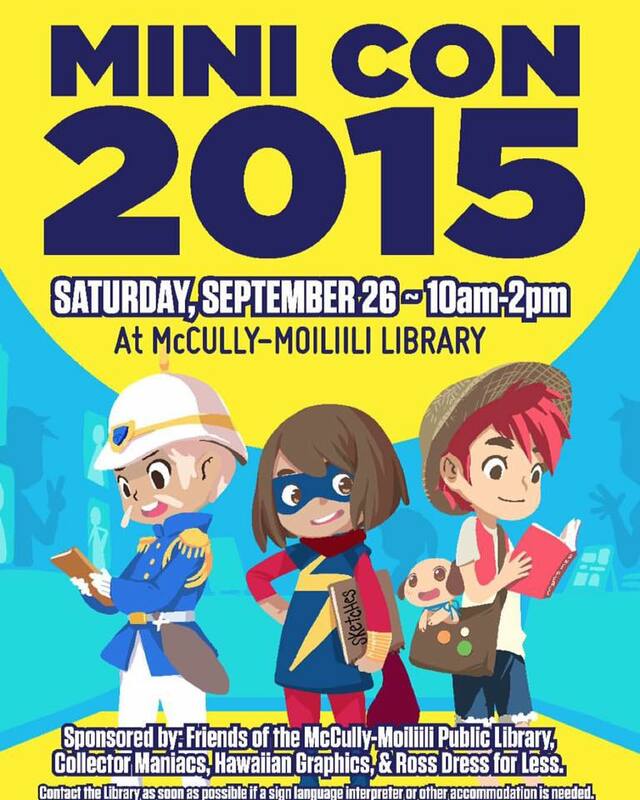 Comic Jam Hawaii has you covered in this free workshop at Aiea Library. Paper, pencils and crayons will be provided, or bring your own art supplies if you wish. Recommended for ages 8 and older. 1 to 3:30 p.m. Saturday. Free Comic Book Day: The name pretty much says it all. Full details coming in next week’s Cel Shaded Report, but for now, let’s just say that there will be costumed characters aplenty, possibly at a library near you. May 4. Comic Jam Hawaii: This group of collaborative cartoon artists meets every first and third Sunday of the month at Pearlridge Center; locations within the mall may vary. 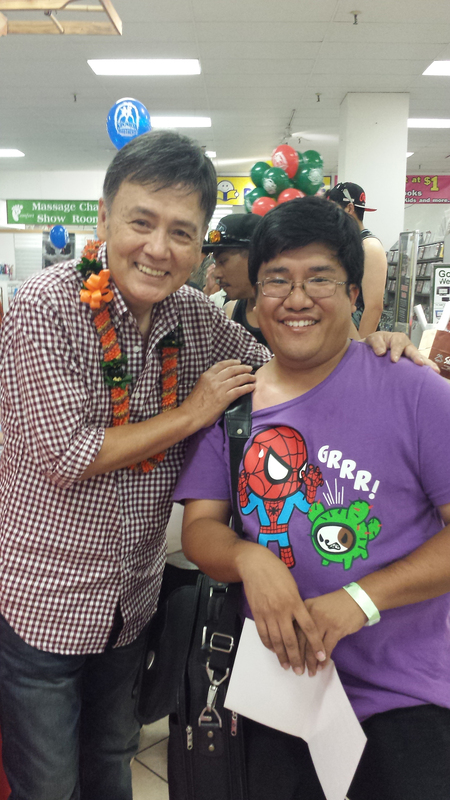 Visit www.facebook.com/groups/ComicJamHawaii (Facebook login required). Next meeting: 1 to 4 p.m. May 5. 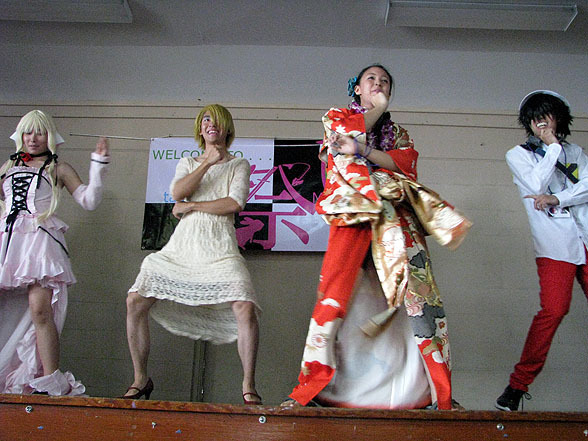 Maui Matsuri: Annual Japanese festival held on the University of Hawaii-Maui College campus. May 11. 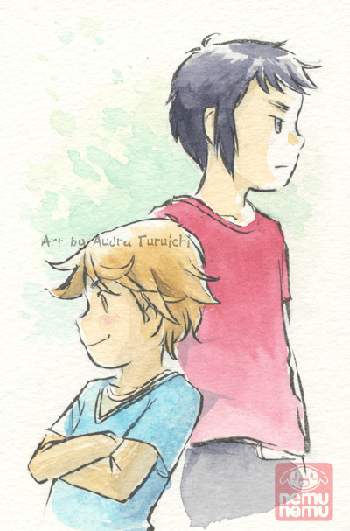 Tomo-E-Ame: Friends-Drawings-Candy: MangaBento’s 2013 exhibit at the Honolulu Museum of Art School, June 16-July 14. 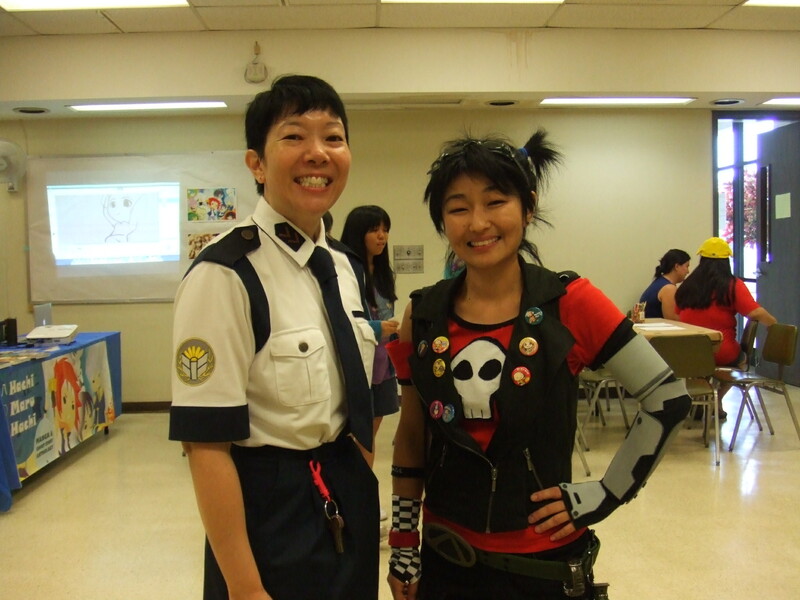 Oni-Con Hawaii: With guest Yuko Ashizawa, a fashion designer with Atelier Pierrot. Also featuring the Cosplay Chess Brigade and Yu x Me Maid Cafe & Host Club. Preregistration open now; $35 for a three-day pass. 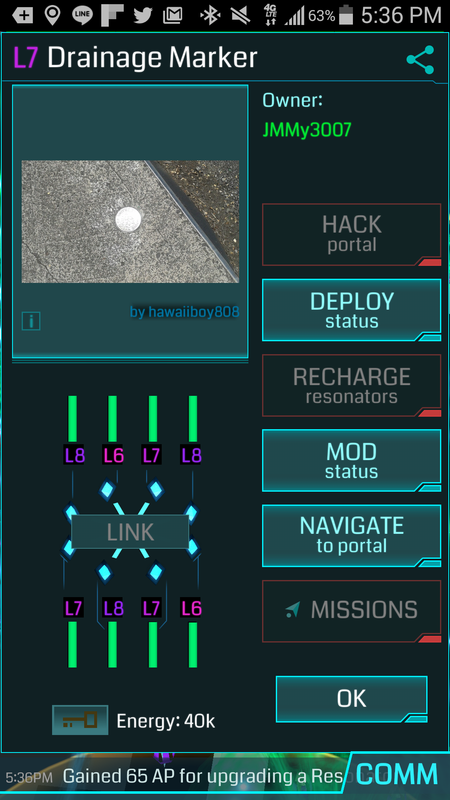 Hawai’i Convention Center, Nov. 1-3. 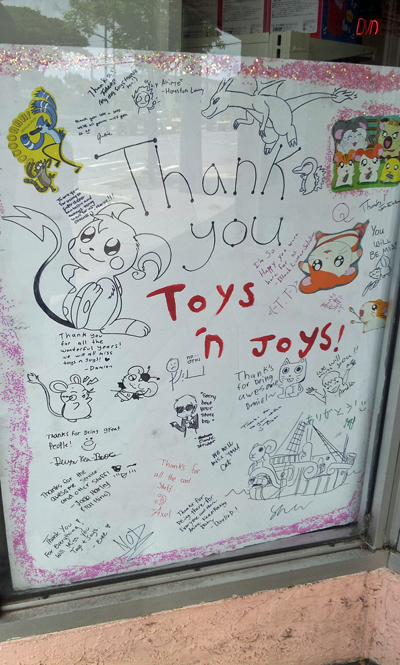 Kawaii Kon 2014: Guests include voice actors Michael Sinterniklaas and Stephanie Sheh. Preregistration opens Wednesday. Hawai’i Convention Center, April 4-6, 2014. … or her own characters like Mayer and Mackenzie from Pizza Hero, from the Henshin Rider/Yellow Jacket story arc. All of these originals — and more! — are available for sale at the Nemu Shop, where Audra’s using the proceeds to pay for her lone out-of-state nemu*nemu trip for this year, the Toronto Comic Arts Festival in May. New pieces are being added regularly (and prices were recently cut on what’s been posted, too!) so Jason encourages you to check it out. After all of that, if you would still like to leave a message, please do so at the beep. However, it is recommended that you not make any references to certain footwear, headphones, designer handbags, music players and/or pharmaceutical aids, as they will be marked as “spam” and disposed of accordingly. Otaku Fair at Shirokiya: Hosted by Hakubundo Bookstore with volunteers from the University of Hawaii at Manoa Anime Manga Society. Pick up art books, Japanese-language manga, posters and assorted character goods. Through Sunday. 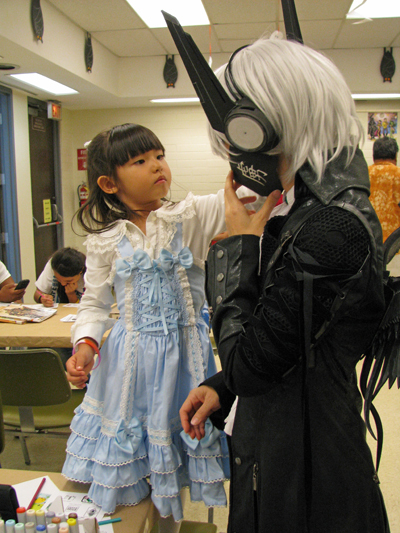 Aiea Library Anime Club: This month, librarian Diane Masaki is screening the always popular Black Butler. For more information or to RSVP, call 483-7333 or e-mail aiealibraryanimeclub@yahoo.com. 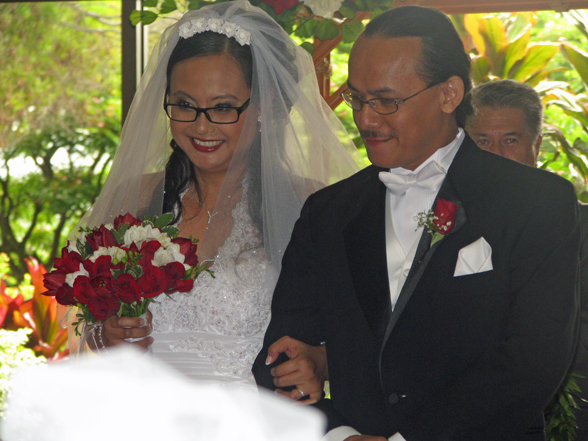 3 p.m. today at the library, 99-143 Moanalua Road. 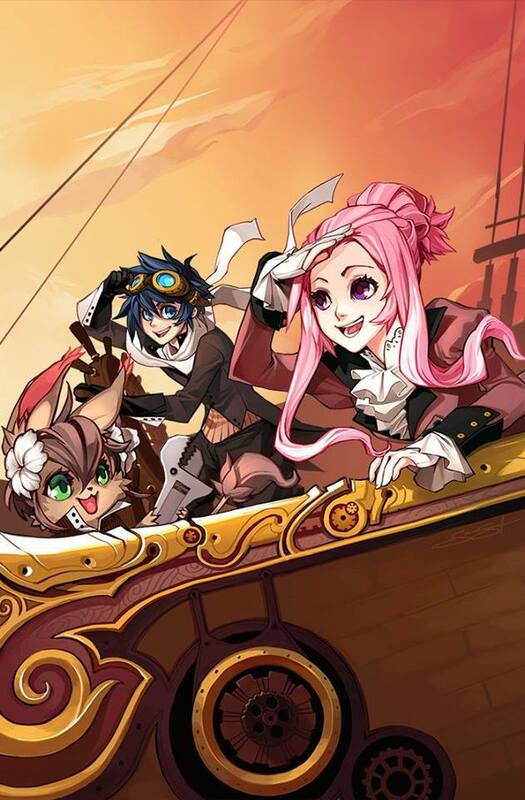 MangaBento: This group of anime- and manga-inspired artists usually meets every second and fourth Sunday of the month at the Academy Art Center, 1111 Victoria St., Room 200. Visit www.manga-bento.com. Next meeting: 1 to 4 p.m. Sunday. Open Cosplay Shoot: Got a lovely costume that you want to show off and want to capture it on film … err, pixels? (The digital era: changing the way we think about things since time immemorial.) Come on out to the first large-scale open cosplay shoot of the year at the Aiea Loop Trail. Cosplayers and photographers, meet at the first restroom at the head of the trail, and go from there. Happy cosplaying/shooting! 10 a.m. to 4 p.m. Feb. 2. Madoka Magica double feature: Watch the magical girl saga unfold in one big four-hour, two-film chunk comprising Beginnings and Eternal, Doris Duke Theatre at the Honolulu Museum of Art. Tickets are $20 general admission, $18 museum members. 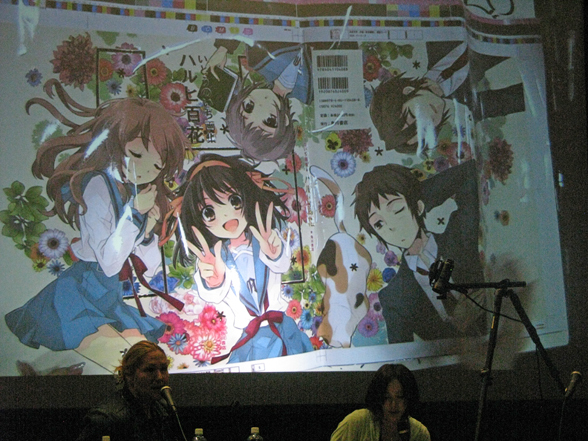 Visit http://www.honolulumuseum.org/events/films/13340-puella_magi_madoka_magica_parts_1_2. 4 p.m. Feb. 27 and 28.